The laid-back vintage vibe of this Land Cruiser feels just right, whether you’re riding along the California coast or kicking up dust on the trail. It’s versatile, clean and dare we say...modern, with an automatic transmission and upgraded engine. 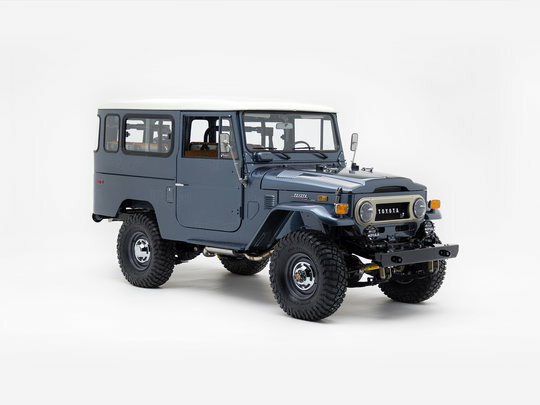 Yet it still retains that unmistakable Land Cruiser look, with 70s-inspired details, and authentic steel armor. Say hello to the Farrah Fawcett of Land Cruisers, an icon that ushered in the era of awesomeness that is the 1970s. But here, those retro details share the stage with modern accessories and heavy rubber, deftly combining authentic good looks with modern utility. It’s a design that’s show-ready and trail-ready. Equal parts beauty and beast. It’s hard to beat to beat an automatic when it comes to pure ease of driving - whether you’re sitting in traffic or staking out more technical trails. But the automatic is only part of the story here. Under the hood you’ll find a fuel-injected Toyota 1FZ engine with ample torque and horsepower for today’s adventures. Upgraded running gear and revitalized 4WD add to this rig’s innate toughness and durability making it a sure-fire contender in the all-around. The cabin of this classic Land Cruiser is the perfect place to revel in the details of the past, and to do so comfortably. Here you’ll find evidence of the old school manufacturing processes: nuts, bolts, and welds. The dash is painted in a custom shade that contrasts beautifully with vinyl-clad seats and retro controls. Modern conveniences: air conditioning, heat, digital sounds and Bluetooth are all standard here, making this Cruiser the ideal companion for the long journey ahead. The G40 Expedition brings the classic adventure into new territory with a 1GR-FE engine and other modern upgrades. Build yours today!